Of War And Kisses: How Adversity Shapes Culture Countries tend to have personalities just like people do. Researchers have set out to define those differences, using a scale that measures how tight a culture's social rules and standards are. It turns out those rules — as simple as where it's appropriate to kiss — are often shaped by a nation's experience with war, crowding and other challenges. 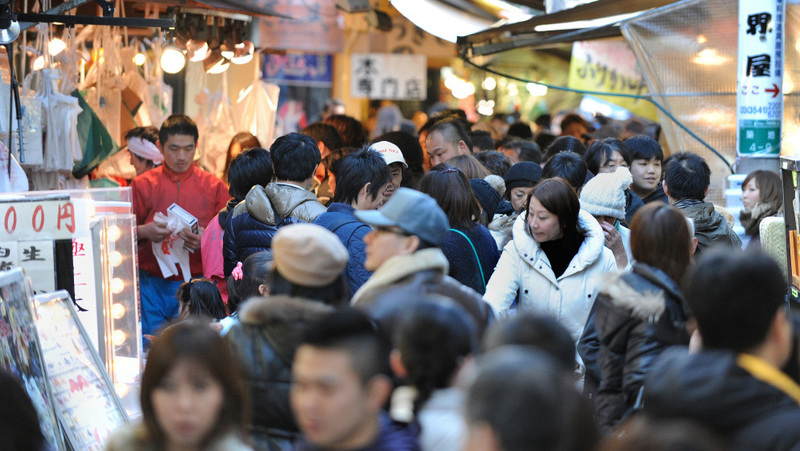 Shoppers crowd a narrow street outside Tsukiji market in Tokyo on Dec. 31, 2010. Japan has relatively tight social rules. And that makes sense, according to researchers. When people are squeezed together, they have an incentive to cooperate. Countries tend to have personalities just like people do. Researchers have set out to define those differences, using a scale that measures how tight the social rules and standards are. They find that cultural rules — as simple as when and where it's appropriate to kiss — are often shaped by a nation's experience with war, disease and other challenges. The idea for this study really dates to the 1960s. Back then, an anthropologist decided to evaluate a few dozen obscure cultures and see if he could rank them on a scale from "tight" to "loose." He defined tight cultures as having a lot of rules, which people violate at their peril. Loose cultures are more relaxed in their expectations, and more forgiving of people who deviate. Fast-forward now to Michele Gelfand, a psychology professor at the University of Maryland. "This research that we did, across 33 nations, was the first to show the distinction applies to modern nations," she says. She and a large group of international colleagues developed a survey that they asked nearly 7,000 people worldwide to answer. "So for example, you might have been asked, how appropriate is it to curse in the bank or kiss in a public park, or eat or read a newspaper in a classroom? And we were able to derive scores of how constrained, in general situations, they are, versus how much they have latitude in different countries." They developed a measure for the 33 countries they studied, and then cross-checked their findings with expert opinions and other methods. Their results are published in Science magazine, and mostly, they match pretty well with common experience. "Some of the cultures that are quite tight in our sample include places like Singapore, Japan, Pakistan," Gelfand says. "Whereas many loose societies include countries like New Zealand, the Netherlands, the United States." The researchers then dug in to see if they could figure out why nations are relatively tight or relatively loose. History was a pretty good guide. Embattled countries tended to have tighter social rules. So did nations dealing with disease or a history of crowding. "In fact, the data show that population density in the year 1500 predicts tightness today," Gelfand says. That makes sense. Cultures all squeezed together, like in Japan, have a strong incentive to be cooperative. Curiously enough, wealth doesn't seem to matter. Well-off Norway, for instance, ranks as relatively tight — it's not so far off from India, which is much poorer. And not all countries are true to type. Gelfand was surprised to find that Israel — which is under threat from its neighbors and its desert environment — is still culturally loose. Gelfand suspects that's in part because lots of Israelis came from relatively loose cultures in Eastern Europe. "It's also a culture of argumentation, debate, dissent, that really is very much consistent with Judaism. And these things all promote looseness," she says. Using a survey of nearly 7,000 people worldwide, scientists measured 33 nations to find out how rulebound they tend to be. Countries with a history of wars, disease or food insecurity tended to have tighter rules. The U.S. scored 5.1 on the tightness scale. These results raise all sorts of questions — the biggest one being, what's cause and what's effect. "That's the million-dollar question," says Ara Norenzayan, a social psychologist at the University of British Columbia who was not on the research team. "At this point, we can't be sure." Norenzayan says there's a lively debate about the extent to which cultures are shaped by the environment, how much they are shaped by our genes, and how much cultures are simply passed down from one generation to the next. While academics wrestle with those issues, Norenzayan says the results from the study in Science can be useful for people struggling to solve the world's problems collectively. "For example, coming into some kind of agreement on how to combat global warming involves coordination of dozens of countries." And it helps to understand each country's cultural perspective, when seeking common ground.